One question I get a lot doesn’t actually pertain to food, it is about what beauty products I use on my skin and for my family. Back in college or actually my entire life it has never dawned on me how hazardous and toxic the most popular skincare and makeup products that we use on a regular basis really are. 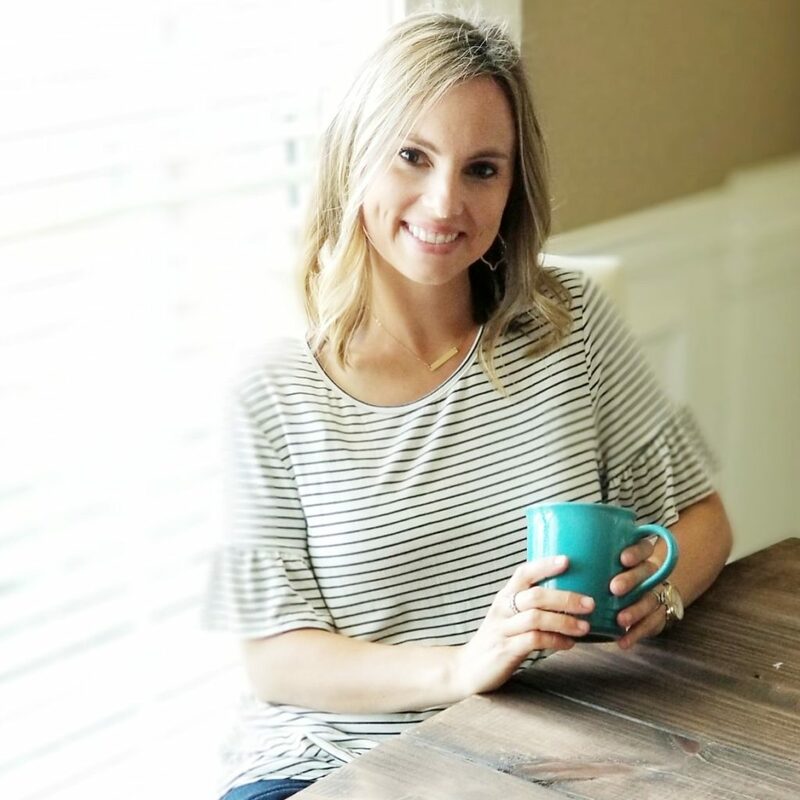 Shortly after we started our journey to real food and switching out our home cleaning products for safer and natural ones, it was then I started wondering and questioning what I was putting onto my body and not just in. Our skin is our largest organ and I truly believe in protecting it and nourishing it just like the inside of our bodies. 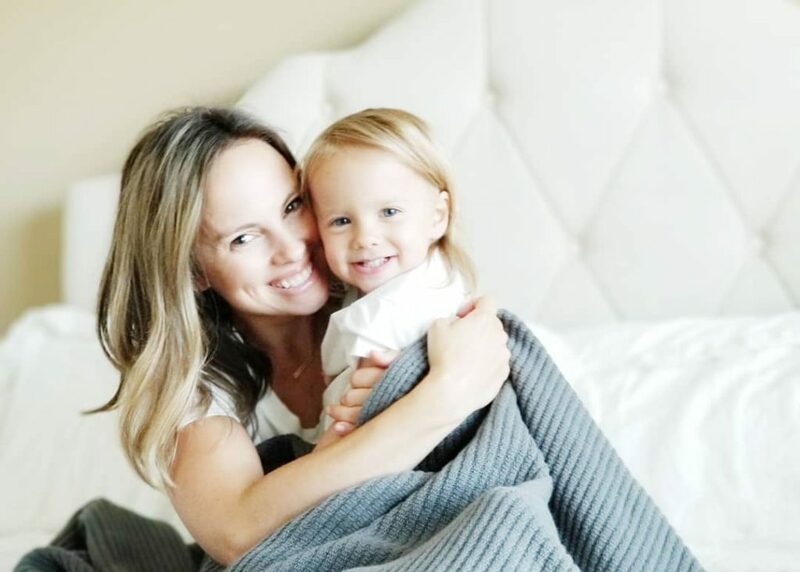 I am especially grateful I dove into this before having children because their skin is extremely more delicate and thinner than ours and we should really be aware of what is going onto them from day one. I by no means have perfect skin but it has drastically improved since switching to natural and organic beauty products along with eating a majority of real, whole foods. I will also add that drinking a lot of water to keep your skin hydrated is extremely crucial too! First thing I do before purchasing any skincare product is I verify the toxicity of it through EWG( Environmental Working Group) Cosmetic Database. If you don’t know about this gem of a site I highly recommend browsing around. 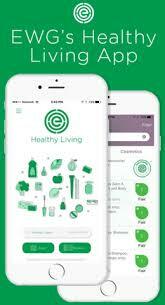 There is also an app you can download on you’re phone called “EWG Healthy Living App”, you can scan products while at the store directly on your phone and it will provide the rating immediately. In a nutshell the database rates products on a scale of 0-10, with 0 being the best & highest rating and 10 being the worst and most toxic. For me and my family personally, I try to stick to 0’s and sometimes I may have to go to a 1 depending on the product. If you are lost and want to explore products there are tabs at the top that have different categories to choose from based on what you are looking for, example a safe mascara or men’s deodorant. I must warn you if you go through your cabinets and cosmetic drawers and go scan crazy, just be ready to be SHOCKED at how many chemicals are in these everyday products and how high of a rating most have. Back to my routine, I am somewhat of a minimalist when it comes to make-up and beauty. Plus I don’t have a ton of dollars to be throwing out on products so I feel all of these products are very reasonably priced and perfectly fit my SAHM budget! Now, if you’re looking for actual make-up tutorials and how to wear eyeshadows sorry I am not your girl. If there are multiple steps in a routine I am most likely going to forget or not follow through so keeping it simple and basic is what works best for me personally. I’ll start with 3 of my most favorite face washes, then show you moisturizer, and finally some super affordable and non-toxic make-up. 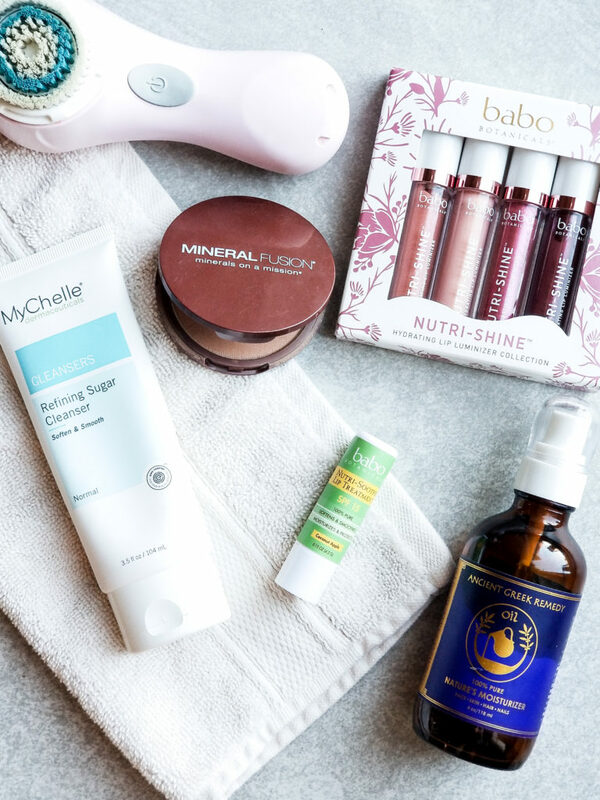 *I do not suggest or recommend products that I do not personally love, all of these products I have been using for a long period of time and have shown positive results for my skin. Also, that doesn’t mean what works best for me will work for you. If you are having issues with your skin try switching to natural products(and of course eating majority real, whole foods) before jumping into super expensive and typically super harsh regimens. All of these last me about 6 months total using twice a day, everyday! This face wash was the very first one I purchased several years ago and it is still a favorite. If you like smell good scents the rosehip is so sensational. *This will lather and foam up in your hand. Rated 1 on EWG. Another great option from Be Natural Organics, which is one of my favorite natural skin care lines. I use this gentle foaming face wash morning and night and it is a great price point , coming in a few dollars less than the Rose Hip above. *Top Rated product on EWG. New products and a completely new line I have been using the past few months is this Acure Organics. I have been extremely satisfied with these products and love them! 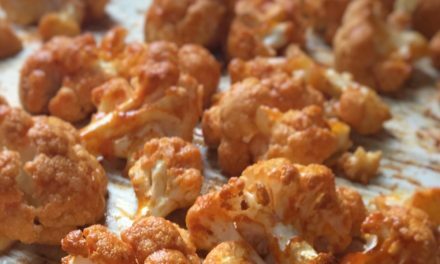 Not to mention you can grab a couple of these together for just under $20. 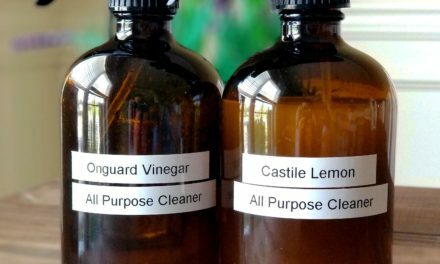 I use the rejuvenating cleanser on a daily basis and then the brightening facial scrub twice a week. 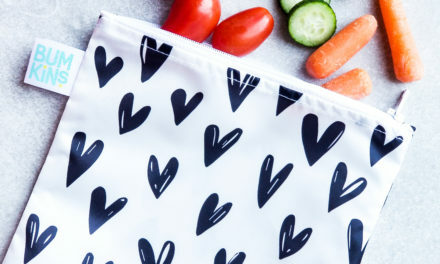 *These are not available on EWG but this company uses pure, plant-based ingredients and based on the research I have done I trust and approve their products. My new favorite facial scrub is this MyChelle Refining Sugar Cleanser and Exfoliator! 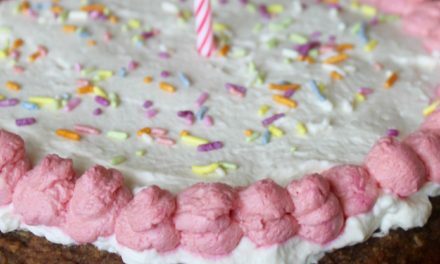 It is infused with vanilla and has the most delicious scent. I love how it is gentle on the skin and lathers up so smoothly as you rub it in. I have noticed a difference in my facial skin in just one short month of using this. I highly recommend! Top rated on EWG. I have to say this plays a HUGE role in the condition of my skin and I highly credit this brush for my healthy and smooth skin. It deep cleans pores, reduces wrinkling, and also exfoliates amazingly. I have been using this brush for going on 8 years now and it has made a drastic improvement. Use with face wash twice a day and/or exfoliater. It is worth the investment! This bottle lasts me an entire year using up to 3x a day, everyday. 100% Organic Blend of Olive, Lavender, Almond and Grapeseed oils with Vitamin E. Daily Moisturizer for Skin, Hair, Face, Cuticle, Nail, Scalp, Foot. Pure Cold Pressed, Full Body oil for Men and Women I have been using this multi-purpose moisturizer for about 1.5 years now and I am obsessed! I use it 2-3 times a day. I highly recommend reading the product description to learn about how each one of these oils contributes and works together to provide top quality nutrients for your skin. Plant Therapy USDA Certified Organic Frankincense Carteri Essential Oil. 100% Pure, Undiluted, Therapeutic Grade. 10 mL (1/3 Ounce). If you have oily skin and the Greek oil isn’t a fit for you this is the basic everyday gentle moisturizer I have used. It is nourishing and gentle and keeps your skin hydrated. One of my favorites! *Rated 1 on EWG. Love all Mineral Fusion products and this pressed powder is my favorite! *All Mineral Fusion’s products are top rated on EWG. I was recently introduced into the world of BB cream and there is no going back! I use this in place of foundation. (Before I did use Beauty Counter Dew Skin tint foundation if you still prefer foundation, it was amazing). * Top rated on EWG. Love this bronzer especially in the summer time, all I have to do is gently apply over some face powder and I’m good to go. I love the shimmer it brings to my skin. * Top rated on EWG. I will admit I may or may not be Amazon-ing this eye shadow as I type this. This has been one of the last things for me to switch over but I am so excited this gave me the kick to do it. I can not wait to use it! *Top rated on EWG. I am really particular about anything that closely to my eye so this eye brow pencil is my trusted fav! *Top rated on EWG. Mascara is the first beauty product I switched out. Did you know most conventional mascaras have coal tar in them, as in the stuff they use to pave roads? After reading a very validated article on the chemicals found in conventional mascaras there was no going back. I will link the article here so you can read for yourself. I have tried very many natural mascaras and this is by far the best and my favorite. I love the volumizing! *Top rated on EWG. Gabriel Cosmetics Inc. – Blush Apricot – 0.1 oz. This is my number 1 favorite blush. It is so delicate and fits my skin tone perfectly. These are my two favorite natural concealers. Both provide excellent coverage and I say I love both equally! I am pretty basic when it comes to lips. Babo Botanicals sent me their new lip tint conditioner and I am literally obsessed! I was already a huge fan of their Coconut Apple Lip Balm. Both have built in SPF 15 and they keep my lips so hydrated and moisturized. The Wild Rose color is a beautiful natural color and gives my lips a nice sheer color. As mentioned above this is my all time favorite lip balm and I can’t live without it! *Note- it is rated 6 on EWG but if you look at the Ingredient concerns it scored higher because of the scent. The rest were very minimal so I feel it should be rated much lower. Finally switched out my lip glosses for a natural and safe version. These Babo Botanicals lip shines are my absolute favorite! They are not sticky and contain coconut oil and cocoa butter to keep lips super soft. You get much more bang for your buck purchasing the pack of 4, you basically get two free. Highly recommend these! I love this pure seaweed mask, it makes me think of the ocean every time I open it. It contains 14 vitamins & 16 amino acids and is my go to for tightening and brightening. This container will last me almost a year+ , I use this 3-4 times a month. 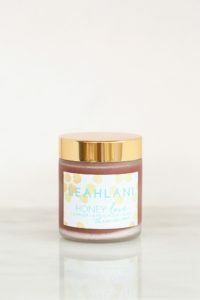 If you haven’t heard of Leah Lani Skincare or Honey Love you are seriously missing out and I’m about to fill you in! I discovered this line about 18M ago and I fell in love the very first time I used it, even the packaging was spectacular and they sent me a couple of amazing samples! Honey Love is a 3-in-1 and it is honestly one of my very favorite products on my vanity! Other Leah Lani products I have used and loved include Bless Balm, Mermaid Mask, & Champagne Serum. These products are home crafted in Hawaii and uses only the purest of ingredients. All are top notch and smell SO devine. When this mama really wants to treat herself, I order Leah Lani! 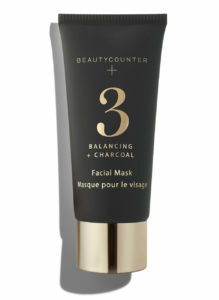 Recently one of my followers sent me some Beauty Counter samples and this charcoal mask was one of them. I have been wanting to try it for awhile so I was thrilled. Charcoal is known for minimizing appearance of pores, detoxifying skin, and making skin more clear and tone. O-M-G guys it truly is amazing! I used it a total of 4 times and it was heaven every single time especially the peppermint scent. I will for sure be ordering this one and keeping it stocked on my vanity! A great item to treat yourself with. That’s a wrap and I hope you enjoyed this post! I did not include any bathing products or other natural routine products such as toothpaste, deodorant, and also did not touch on kid’s products. If you would like more information on my go-to products for babies and kids please drop a comment on this post or feel free to message me so I can create a separate post just for children! For all other everyday products please visit the Natural Beauty Tab on the blog located under Favorite Essentials Shop tab. *Some of the products and links are affiliate links meaning I may earn a small commission if purchased through them. Please know there is no additional charge to you as the purchaser but that these commissions help fund my website and fees associated with it. I never link products I don’t personally use and love. Any support is tremendously appreciated.